The request failed due to a fatal device hardware error can occur frequently when the SSD/hard drive on your PC is damaged. This can lead to severe data loss. Here you will get the best way to fix this error and restore all the lost data. “The request failed due to a fatal device hardware error” Getting this error on your Windows 7, 8, 10? Windows displays this error when your hard disk drive or SSD is physically damaged. This puts you in a situation where your operating system is unable to access this drive. So you will not be able to perform any operation like reading/writing on it. Sometimes the fetal device hardware error is seen frequently in WD, Seagate external hard drives or SD cards. What you can do is to fix the problem and then get back all your data using Free Data Recovery Software. As we discussed earlier, the error is caused mostly because of hard disk corruption or if it is in a bad condition. The three reasons why this can arise are listed below. The hard disk may contain bad sectors, corruption or wrong mappings. The hard drive cable can have faults. So when you connect this faulty hard disk with your PC, data transfer is restricted. Loose connections can also lead to this error. There can be a hardware fault in your hard disk drive even if the cables are in good condition. Try a different USB cable while connecting the drive to your PC. Update your drivers right away. Windows provides disk maintenance tools to handle such issues. This is very simple to initiate and is a common way to fix fatal device hardware errors. This tool is the Diskpart Utility. Here are the steps to follow. Boot your PC and click “Start” on the Desktop. Then click “All Programs”, followed by “Accessories”. Now, right-click and use Command Prompt. Select “Run as administrator”. A new Command Prompt will appear. In this Command Prompt, type “CHKDSK/F” and press Enter. This command will automatically fix all the file system errors present in the hard disk drive. In case, the cause is bad sectors, then type “CHKDSK/R” on the command prompt. Note: When this CHKDSK command is unable to detect errors, then go to Access Window by pressing Windows+E. Right-click on the drive and click Properties, then go to Tools. Here press Check below Error Checking. This may take a while. Then reboot and try accessing your drive. Open Disk Management by entering “diskmgmt.msc” for Windows 10/8. In Windows 7 you can get it by selecting “Manage” by right clicking on Computer. When you see your hard drive, right-click on it and tap “Initialize Disk”. You can choose either (GPT) GUID partition table or simply MBR (Master Boot Record) to initialize the hard drive. Note: Both these methods are reliable to fix the message of fatal device hard error. But what about your data stored on the drive? There are high chances of losing your data, so it is important to use a recovery software like Bitwar Data Recovery to get back all your data. Step 1: Install Bitwar Data Recovery Software for your Windows PC. Then create a software account. Step 2: Launch the software and it will instantly detect all drives on the computer. Select the drive that was fixed from the error. Now click “Next” button to scan the selected drive. 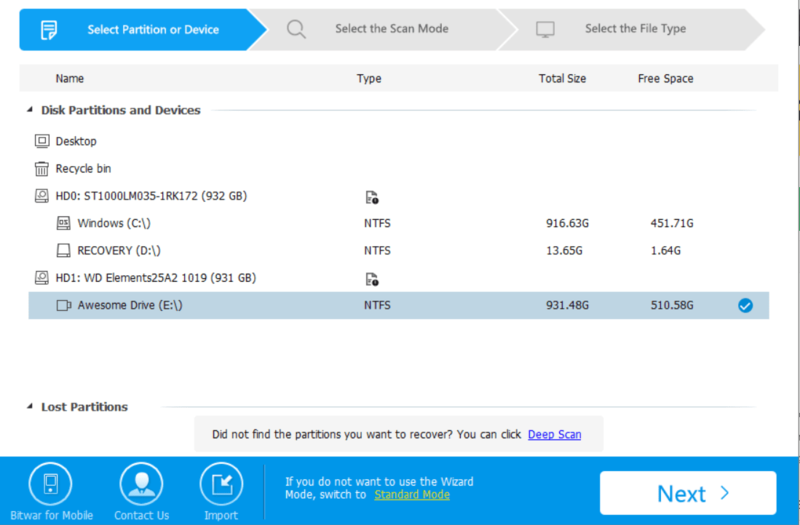 Step 3: Bitwar Data Recovery Software gives you three Scan modes, Quick Scan mode, Formatted Recovery Scan, and Deep Scan mode. You can select the desired scan mode. 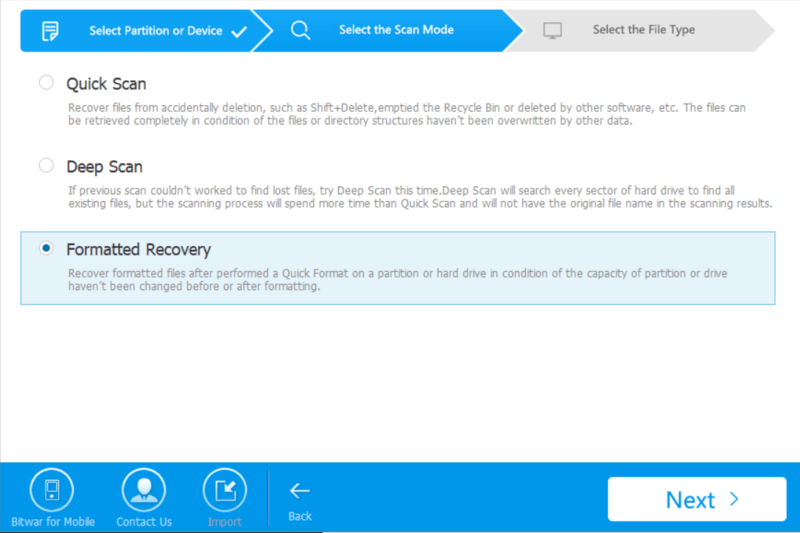 Go for the Formatted Recovery scan mode for restoring files that were deleted. You can click this when you have completed the Quick Scan. After selecting the suitable mode, click “Next”. 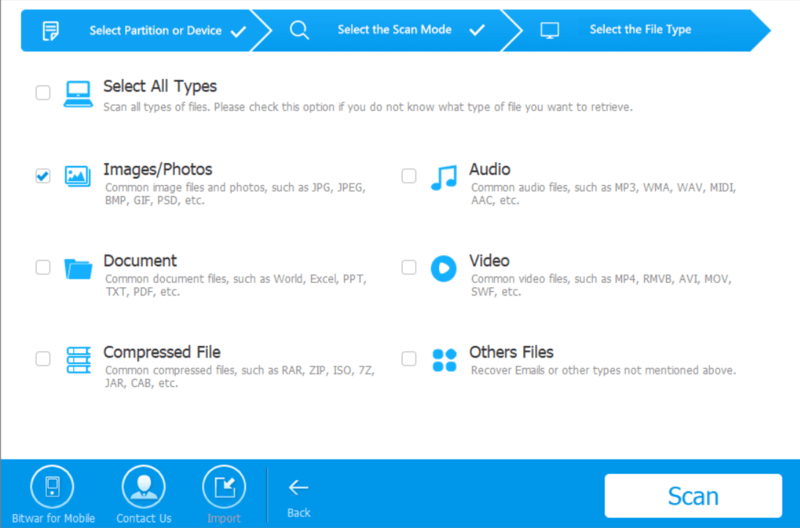 Step 4: To quicken the process of scanning, Bitwar Data Recovery Software allows you to select the type of files to be retrieved. You can also select all files for recovery. Now click “Scan”. 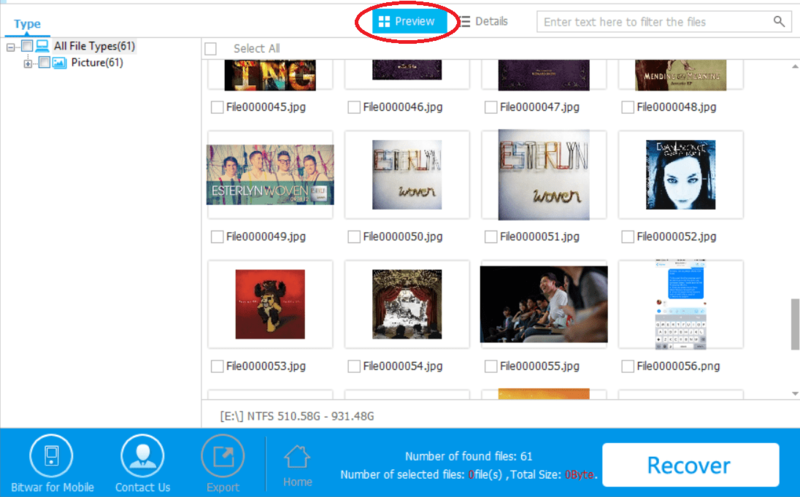 Step 5: After scanning, use the Preview option to view all of the needed files. Step 6: Click on the file that you like to restore and then click “Recover”. Then assign the destination to which you like to get the files back. Now you have successfully fixed the request failed due to a fatal device hardware error! Along with that, you have also safely recovered the deleted files as well. It is always good to be aware of such issues and how to deal with them. Make sure you keep your hard disk drives and portable drives safe. Most importantly, remember to keep a backup of your drive data no matter from your external hard drive or SD card, USB flash drives. If you delete the files due to some error, not to worry at all! Because Bitwar Data Recovery software will help you secure your data anytime. Highly recommended tool!